Building trust within your company is essential to business morale, and so is maintaining a positive customer experience. Success for every business comes when both employees and customers are left happy with their experience with that company. And, there are ways to ensure that happiness. We are here to help you find that success using personal identification. 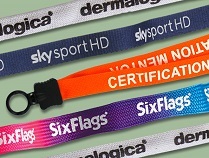 From branded lanyards to reusable name badges, personal identification can guarantee a trust-building experience for all involved. Name tags humanize a company by putting a name with a face. And when you have your employees use not only their name on a name tag but your company logo as well, this builds a trusting relationship with your customers. And, while customer satisfaction is a high priority for all businesses, helping employees feel comfortable in their working roles is also important. Name tags will help accomplish both. Use name tags to not only let customers know who your employees are but to quickly and easily identify those who can help. Don’t underestimate the power of personal identification tools. Name plates are also a useful tool to improve any experience within your company. From signage to room identification, help your customers easily navigate your business. Use them for employees who have an office. Or use them to identify different sections of a store. Yes, signs are also great for this purpose. Or customize each of these products for nearly anything you can think of. And, don’t forget that we have a new plaque line. 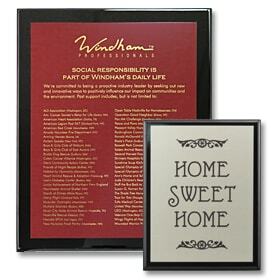 These plaques are a unique way to display instructional information about your company. From a motto at the front receptionist desk to information about how long your company has been around, customize a plaque that fits your business. So, harness the power of your customer’s experience with custom name tags and other personal identification tools.